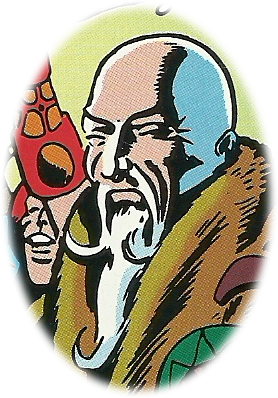 Hollywood Reporter Headline: "Tilda Swinton is in talks to play the Ancient One in Scott Derrickson's Doctor Strange"
For those poor folks who don't know about the comic characters spawned by Steve Ditko, who also created Spider-Man, here's the background: The Ancient One in comics was an ancient Tibetan-styled reclusive monk who was the mentor of Doctor Strange. For those like me who don't keep up with modern Hollyweird, "Tilda" is apparently female. This caused the Hollywood Reporter's Graeme McMillan to gush, "Marvel appears to be finally making a welcome step in a direction that other comic book movies have been moving in for some time." Swapping a woman out for a man. Graeme thinks it's long overdue to eliminate more longstanding white male role models. Because, diversity. I almost left a comment on the article. I wrote it up. Then I saved it to a file instead. When I thought about the blowback I might get from social justice warriors who might be irritated by my comments, I thought, in the immortal words of Sweet Brown, ain't nobody got time f'r that. The article was repeated by Jay Jayson at ComicBook.com. I was tempted to leave my comment there, among readers more comic-book aware and maybe less left-leaning on the whole. Hello, Hollywood. I know you won't believe this, but out here in the Real World, this push for "diversity" seems to have mutated (and not in an X-Men way) into a serious mental disease, one in which people attempt to bend media to inappropriately reflect some minorities as far more prevalent than they really are, and eliminate perceived unfair "majority" figures. It's really too bad Hollywood has to do-over the Big Company superheroes when there are comic-books, and superdupers, about and by ethnics, that deserve to see the big screen, but alas they're not guaranteed-success Marvel-DC properties. Trans-racializing has been going on aplenty. Black "James" (don't call me Jimmy) Olson has already appeared in the new ("bootlegged") Supergirl pilot, Black Nick Fury is of course in all the modern movies, but I think they did that in the comics before the movies. In the current Flash TV series, Flash's future wife, Iris West, and her father, are black — and besides that, semi-orphaned Flash-Barry was raised in their house, so the Iris-Barry relationship is as uncomfortably incestuous as step-siblings can be; extra special "diversity". There are surely even more superheroes affected by revisionist revitiligo, as The Boondocks' Uncle Ruckus might put it. (Noting especially that none of these blacks sound or act "black" anywhere near as much as gangsters on Gotham sound Italian, at least we don't need Ghetto-English subtitles.) If this trend increases, ABC will have to merge with BET. Oh, c'mon. That was funny. Maybe you have to be White. Okay, but that's merely race-swapping. We need more gender-swapping, right? Right? Amirite? Amirite? Weirdest thing about diversity for diversity's sake is, people you meet who are brown, red, yellow, Jewish, Mormon, male or female — they are whatever they are and where they are for real reasons. One might cast a black man as Romeo on-stage, where there's a different level of suspension of disbelief than with a screen portrayal; it's simply not historically sensible for a serious historic portrayal of 16th-Century Verona. This current pattern of substitution based on race or gender is done without any sense of such background. For advancing awareness, it's not per se so very harmful. Play with themes. Create alternate universes. It is seamless sometimes. Other times, it's just painfully obvious someone said, "Hey, we need an ethnic here!" or "Can we make Testosterone Guy into a Woman, just because, Diversity!" It's true non-Europeans were under-represented in comic books for a long time, as superpowered women were also relatively few, but why does every damn movie-ized role have to include a flaming transgender of color? Yes, for emphasis I exaggerate, but, really, we've gone 'way past reasonable "inclusion," and deeply into "in-your-face" overloading. It is especially jarring to see a former brother and sister be of two different races in the new Fantastic Four. There will be some explanation, but who cares? It was obviously just done "because diversity." I think that actually cheapens the whole purpose; I'm offended by this triggering microaggression, for the sake of women and ethnics. Why not make the brilliant Reed Richards a Korean? Because that's not PC in the right way. T'challa "The Black Panther," Kirby's great first black superhero, King of Wakanda, will not be made over into a white African, I'll bet. Why not, in the name of random "diversity"? Will the Ancient One even still be Tibetan? "Free Tibet" is still PC, right? Whoops! Excuse me for speaking. Being a male-identifying Anglo-Saxon Protestant conservative, nothing I have to say is of any value. Carry on.